With FRC, there is an abundance of freedom with robot design. The size constraints for this robot are 5′ tall by 4′ front to back and 3′ wide and the robot has to weigh less than 120lbs, after that one can use whatever parts one can pay for. However the total bill of materials cost must be less than $5,000. The reason that FRC is unique is that during every match, you are randomly assigned alliance partners. 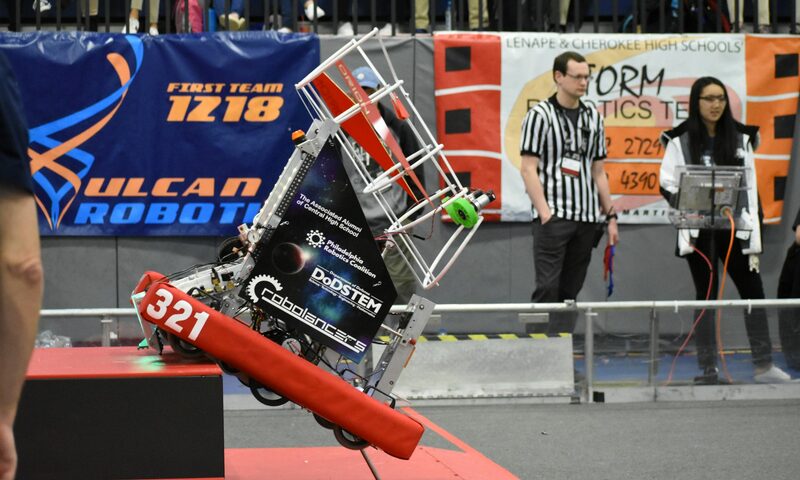 3 robots make an alliance, and they cooperate to gain points. A team that is on your alliance during one match could be on the opposing alliance the next match. Teams are seeded by how many games their alliances have won, and coopertition points, which are gained by cooperating with the other alliance to gain points. An example of this are 2 robots from opposing alliances working together to balance on one bridge, which was featured in 2012′s game, Rebound Rumble. At the end of preliminary matches, the top 8 seeded teams are identified. Then they pick teams to be on their alliances, for the elimination tournament. Teams play in the elimination tournament, until one alliance is crowned champion. FTC is one rung down on the ladder of FIRST competitions, as it is for both middle and high schools. The size constraints are 18″ by 18″ by 18″, which is much smaller than FRC. The playing field is only 12′ by 12′, which is a bit of a step down in comparison to FRC, which takes up the space of a basketball court. Teams are restricted to the TETRIX kit, LEGO, and raw materials. This is unlike FRC, where anything one can purchase can be used (as long as it does not break a rule). Another difference is in the maximum allowed to be spent on the final Product is lower. Alliances in FTC are 2 robots each, one less than FRC. The format for eliminations are the same, just simply on a smaller scale. The combination of all these makes FTC a great alternative for teams who either have a very small budget or level of experience. It does so by not being so simplified that it limits imagination, but not so large, complex, and costly that it requires years of experience and thousands of dollars to even try and have a team. Teams can also use it as a great way to gain experience for FRC.